Vaccines save millions of lives every year, but patients who have a bad reaction to an immunization may suffer lifelong complications. Children are the most common victims of serious vaccine injuries, including brain damage (known as encephalopathy). While these cases are extremely rare, vaccine-related brain damage can cause difficulties for children and families, including developmental problems that may be permanent. Most scientists refute the claim that vaccines can cause autism. However, it is generally acknowledged that vaccines do have the ability to cause brain damage of varying degrees in some patients. The onset of neurological illness after immunization, particularly developmental regression and seizures, has been widely recognized—and even the federal government offers compensation for cases of vaccine encephalopathy. Gene mutations. Many children who have suffered vaccine encephalopathy were discovered to have an underlying genetic mutation that was responsible for causing seizures. Gene mutations, such as severe myoclonic epilepsy, often lay dormant until a catalyst causes spontaneous symptoms. These may arise after an injection and are usually not inherited, causing parents to attribute the injury with the immunization. Multiple immunizations at one time. Vaccines are often scheduled at intervals to allow the body to recover and adapt from the vaccination. If multiple vaccinations are given at once, children are more likely to suffer side effects—including rashes, irritability, and developmental problems. Enzyme dysfunction. Studies have shown that children who have trouble producing or processing enzymes are at higher risk for mental and emotional regression after vaccination. Children should be blood tested before immunization to rule out mitochondrial enzyme dysfunction, particularly abnormal levels of lactic acid and creatine. Fevers. Fevers are a common side-effect of immunization, and typically only last a day or two in most patients. Some children who suffer developmental problems after vaccination are not injured by the vaccine, but by the onset of fever that occurs after an immunization. In particular, the measles, mumps, and rubella (MMR) vaccine has been known to pose a small risk of seizures due to the likelihood of fever after injection. Seizures following MMR are rare and have not been known to cause long-term effects. However, the risk of febrile seizures increases with the age of the infants, so it is recommended that children be vaccinated as soon as they are medically cleared to do so. Children with vaccine-related encephalitis will typically experience reactions within two weeks after the date of immunization. Symptoms may include fever, seizures, muscle weakness, irritability, and shortened attention span. In milder cases, children may complain of headaches, feeling tired, and pain throughout the body. In most cases, symptoms will only last a few days. However, parents should monitor their children closely after vaccination and report any symptoms to a healthcare provider to see if any further treatment is needed. 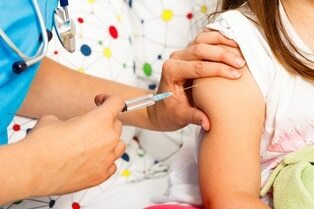 If a child has suffered severe injury after vaccination, there is help available. Patients can get compensation for vaccine injuries through the federal government’s National Vaccine Injury Compensation Program (NVICP), which allows parents to collect payment without filing a lawsuit. As long as your child was injured after receiving one of the recognized vaccines, you will be eligible for compensation. If your NVICP claim is denied, your only remaining option for compensation is to file a vaccine injury lawsuit. Not only can a lawsuit provide payment for the medical costs of your child’s injury, it can provide compensation for any future disability and loss of income caused by the injury, pain and suffering related to the incident, and the legal costs and fees related to your vaccine injury claim. The key to winning your vaccine injury case is the tenacity of your injury attorney. We can gather evidence on your behalf and fight aggressively to prove that your child’s encephalitis was a result of vaccine administration. Call us today to schedule a free, no-obligation consultation with one of our attorneys, or take a moment to fill out our online contact form.